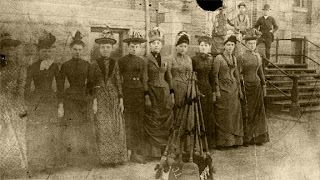 The members of the 1888 Broom Brigade from left to right: unidentified woman; Minnie Moore (later a school teacher); Mrs. Ernest Cassity (Minnie’s sister); Sally Belle Baker; Mayme Combs; Elmer Allen; Kate Baker; Hattie Warner; Annie Baker, and Sallie Hornbrook. On the steps are: Mary Lou Baker; Vergie Hearne; and Joe Hearne. The Broom Brigade would drill with brooms as the cadets did with guns. In the post-Civil War era, military drill was a popular form of exercise, and judged drill competitions between rival college battalions was entertainment. It is speculated that in many broom brigades across the country, that it wasn’t the chance to play with guns that inspired the coeds as much as to get some exercise – and to be able to do the same thing that men were doing. Both domestic in nature, in their choice of using brooms, but also an expression of equality the broom brigades were an indication of the changing role of women.